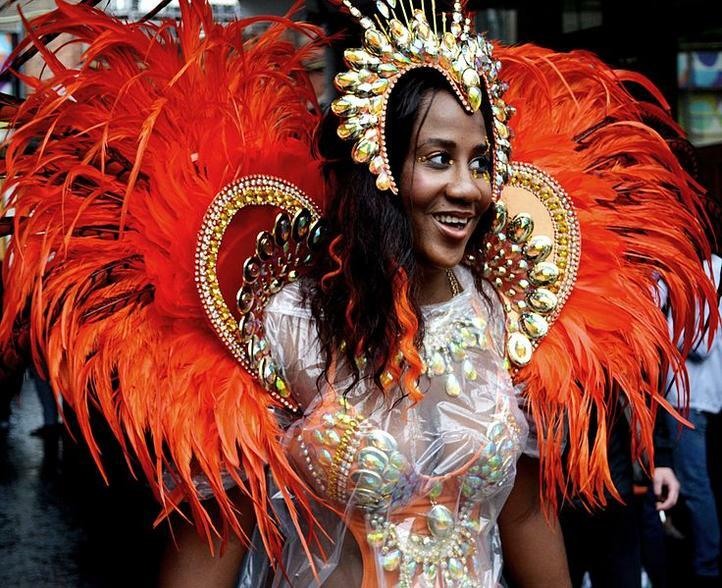 Over a million revellers hit the streets of Notting Hill each year for the annual celebration of London's Caribbean heritage. The two-day extravaganza has been bringing swarms of people together for over 40 years since it began in 1966, with the sounds of West Indian steel drums raising the streets to a fever pitch as families and friends soak up a vibrant atmosphere. You can't overlook the festival's scale; the glorious vibrant colours creat a vast canvas that truly stimulates the senses. You'll quickly be swept along by flamboyantly costumed dancers and parading floats. The sensory overload continues with phenomenal music from all over Central and South America - featuring reggae, soca, blues, Latin, as well as disco, R&B and funky house. With sound systems on every corner, you'll be grooving non-stop. Something you won't be able to escape is the sizzling sound and smell of authentic Caribbean cuisine. Spicy, crispy and barbecued jerk chicken or pork is a staple. If you're not popping over to the West Indies anytime soon, this is the best opportunity to taste that distinctive flavour. The pop-up street food artisans with generations of culinary expertise will leave you with a thirst for more of the incredible, authentic flavours. Saturday is quieter and doesn't include any of the main events. The following day the first parades get into full swing and are filled with rhythm and steel once again. Sunday is considered to be the family day, with the children's parade a highlight. The sound systems fire up too, and soon the streets fill up with dancing, passion and festive spirit. 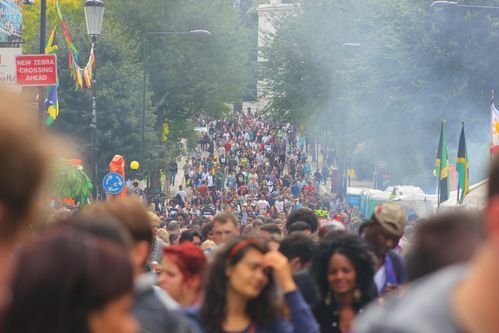 Check out the World Music Stage over at Powis Square for some of the best calypso performances, while the parade itself runs for over 3 miles, weaving in and out of the main streets of Notting Hill. 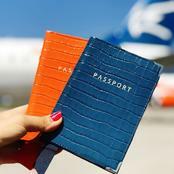 But wherever you are, you'll never be far away from all the action! 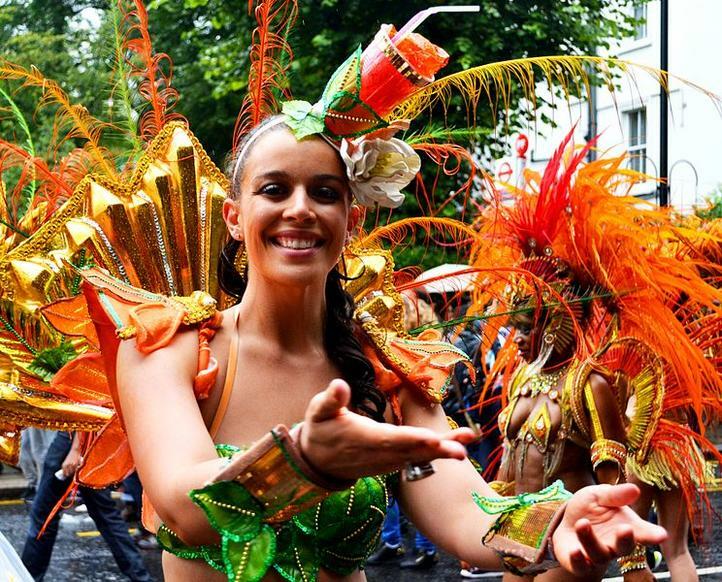 On bank holiday Monday everything gets dialled up for the grand finale, with more dazzling costumes and dancers, and over 60 bands and dozens of sound systems making their way throughout the streets. This is the real festival experience and legendary carnival experience: an explosion of the senses and an outpouring of emotion. Pack light and enjoy the ride, and if you're still looking to carry on the celebrations when the official parade and street fun dies down, there are plenty of after parties the weekend which are worth checking out.